Industrial Visits provide the students with opportunities to plan, organize and engage in active learning experiences both inside and outside the classroom. 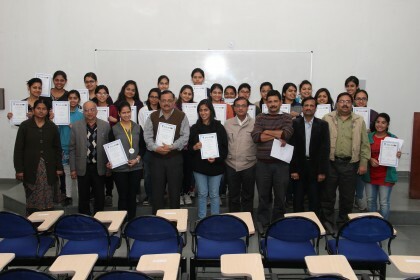 These visits have always offered insights to students about the practical applications of their theoretical knowledge. The Department of Commerce, FASC, organized a one day industrial visit to Saras-Dairy, Palsana on 30th August, 2014 for undergraduate (BBA-II) and post-graduate students (M.Com I and M.Com II). The visit aimed at facilitating the students to acquire the first hand knowledge of the intricate working of Milk-Plant such as formation of milk committees at village level, milk collection procedure, processing of milk related to various products, distribution process, payment mechanism, cost-benefit analysis and organizational structure of dairy. Mr. Rathor, the Agriculture scientist, explained the actual working of Plant in detail which enhanced the overall knowledge of students. International Conference on ‘Human Trafficking Legal and Technological Perspectives for Solutions within South Asia’ to be organised at Mody University.